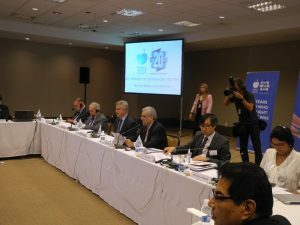 The 59th World Water Council (WWC) Board of Governors’ Meeting was held on 24-25th June 2016 in Brasilia, Brazil followed by the Kick-off Meeting of the 8th World Water Forum. The Board was welcomed by the Governor of Brasilia, Senator Rodrigo Rollemberg, a representative of the 8th Forum host city. Discussions focused on the updates from Task Forces, preparation of the 8th World Water Forum, selection process for the 9th Forum and WWC's position in key international events. 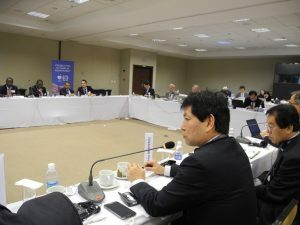 Mr. Kunihiro Moriyasu, Deputy Secretary General of JWF was approved as a new governor of WWC for JWF at this meeting. The JWF was also approved to join the Task Force, "Cities: At the Heart of Growth". The next Board of Governors’ meeting will be held in Marseille, France in November 2016. Having been established in 1996, the WWC will celebrate its 20th anniversary this year. The joint anniversary celebration of the WWC together with Asia-Pacific Water Forum (10 years) will be held on 12th July 2016 on the occasion of the Singapore International Water Week. The JWF continues to work for resolving water issues through the policy recommendations for both Japan and abroad.